The expression “fits like a glove” perfectly describes the relationship between watchmaking and sailing. Top watchmakers have a strong sense of tradition yet are always looking to incorporate lightweight, strong, ultra-durable materials (think carbon fibre and titanium) into their models, just as yacht builders are continually pushing the boundaries in construction. Then there is the purely aesthetic element of design. Watches and sailboats can be things of beauty that possess an “X factor” that goes way beyond mere engineering or technological prowess. The formal rules of sailing were first proposed in the mid 1800s but it was not until 1907 that a world body for the sport was formed: The International Yacht Racing Union, now known as World Sailing. And it was around this time that clockmakers and watchmakers saw the potential for specialist timepieces – initially on a fob or pocket stopwatch – for competitive sailing. Thus was born the regatta timepiece, a nifty piece of chronometry which, via operating the crown or a special pusher, counts down the critical lead-up to the start of a sailing race. There is a unique challenge in sailboat racing. Unlike cars or horses, it is virtually impossible for sailboats to be lined up stationary on the start line. For the race start, skippers need to manoeuvre their craft to be in a prime position, but without infringing the start line and incurring a penalty. Being able to time this to the second is crucial. Here’s a shortlist of some of the best regatta timepieces on the market today. Bremont Regatta II Oracle Team USA. Omega Speedmaster X-33 ETN Regatta. 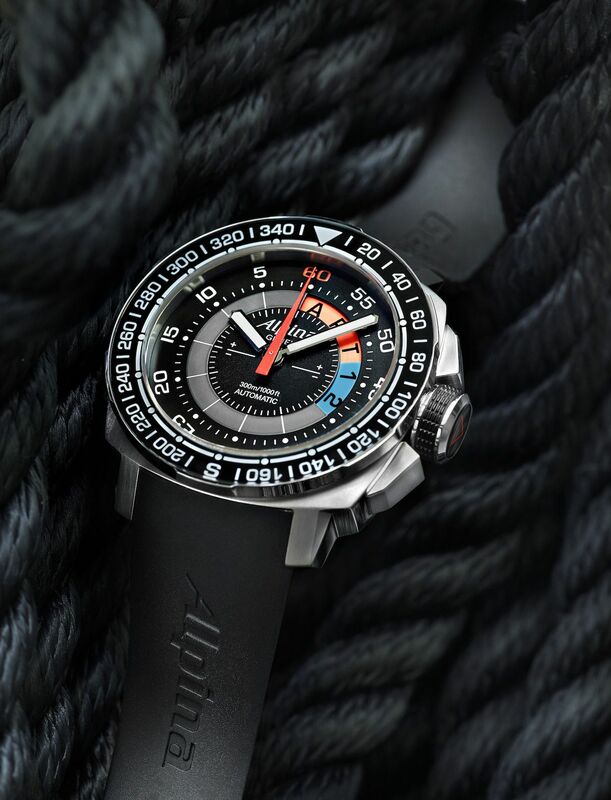 Switzerland’s Alpina released just 8,888 pieces of its cool looking Yachttimer Countdown (44mm, stainless steel case, transparent case back, water-resistant to 300 metres). The Yachttimer Countdown features a central window (from 12 o’clock to four o’clock on the dial) which displays a 10-minute countdown sequence culminating in the word START on a bright orange fluorescent background. The user can also halt the countdown and restart it at the touch of a button. Only a few years old, Britain’s Bremont instantly made a mark in the luxury watch business with aviation timepieces but has expanded rapidly, and successfully, into other fields including sailing. It launched its first regatta timer in 2016 and this year was appointed Official Timing Partner of the America’s Cup held in Bermuda. To coincide with the Cup, the brand launched new Regatta II models, including the Regatta II OTUSA (individually numbered white- or black-dial variants, limited to 235 of each worldwide) which features a regatta timer (15-minute and five-minute countdown) at 12 o’clock on the dial. The watch even incorporates carbon fibre from the 2013 America’s Cup champion Oracle Team USA AC72 yacht in the crown. Italy’s Panerai was a pioneer in dive watches and its big, bold and beautiful offerings have generated a cult following across the world. Stepping into the world of high-end yacht racing, Panerai became the official watch partner of this year’s America’s Cup, producing an official 2017 America’s Cup watch (the Luminor Marina 1950 America’s Cup 3 Days Automatic Acciaio) plus tie-in watches for Cup Defender Team Oracle and Japan’s SoftBank Challenger. Of three editions for Team Oracle, the striking Luminor 1950 Regatta Oracle Team Chrono Flyback is as big as its name (47mm), featuring a three-day power reserve, ultra-strong but light titanium case, and a version of the regatta timer. A red pusher at four o’clock operates the central red chronograph hand, which moves in one-minute jumps to set the countdown position. A start/stop pusher at 10 o’clock then kicks off the race countdown, which can also be reset on the fly without having to futz around with the stop/reset procedure. With an engraved case back featuring the Oracle boat, and limited to just 200 pieces worldwide, this is a true collector’s piece. 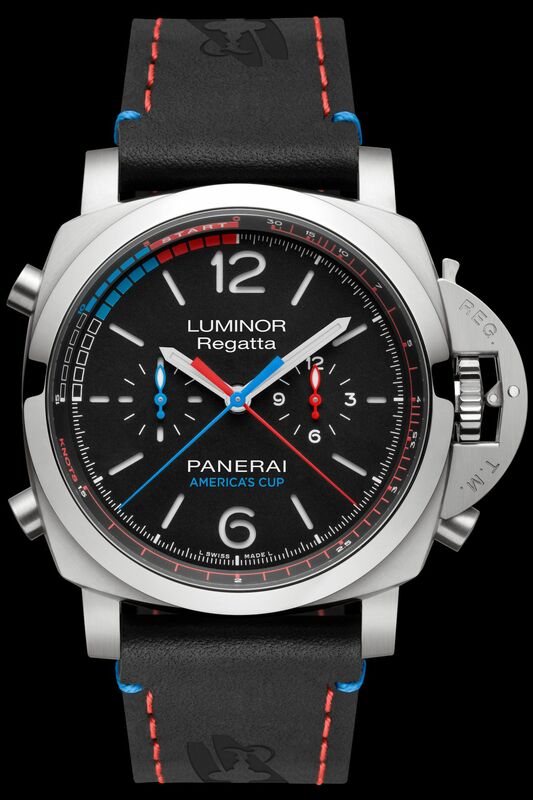 The Officine Panerai America’s Cup models are available in Australia exclusively through Watches of Switzerland stores. 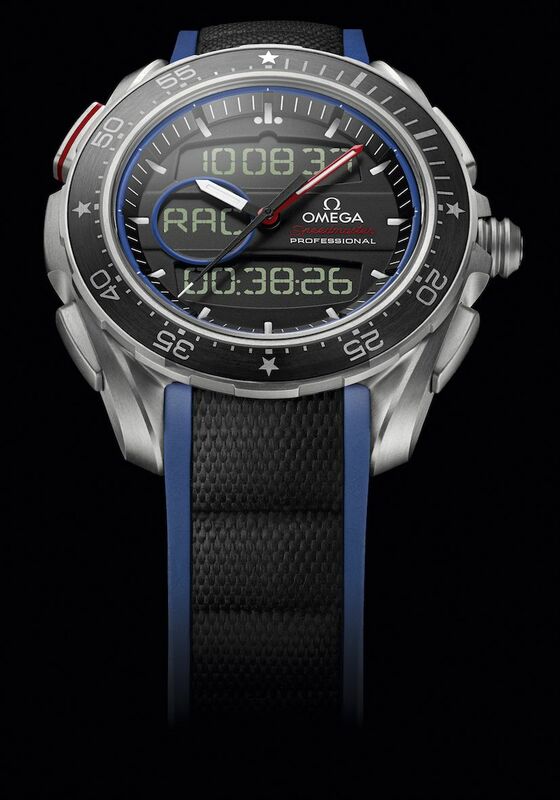 Switzerland’s Omega has been on board New Zealand’s America’s Cup challenge since 1995, under the legendary Sir Peter Blake, and released two models for Emirates Team NZ for this year’s racing: the 45mm Speedmaster X-33 Regatta (2,017 pieces worldwide) and Seamaster Planet Ocean ETNZ Deep Black. The watches must have played their part, as Emirates Team NZ took home the coveted trophy. The very cool X-33 features a dual analog/digital display, with the red pusher at 10 o’clock on the dial that operates the race countdown function and race timer, and the wearer is able to record a “logbook” of up to two races. There is also a raft of other functions – including alarms, perpetual calendar and chronograph – all powered by an Omega quartz movement. 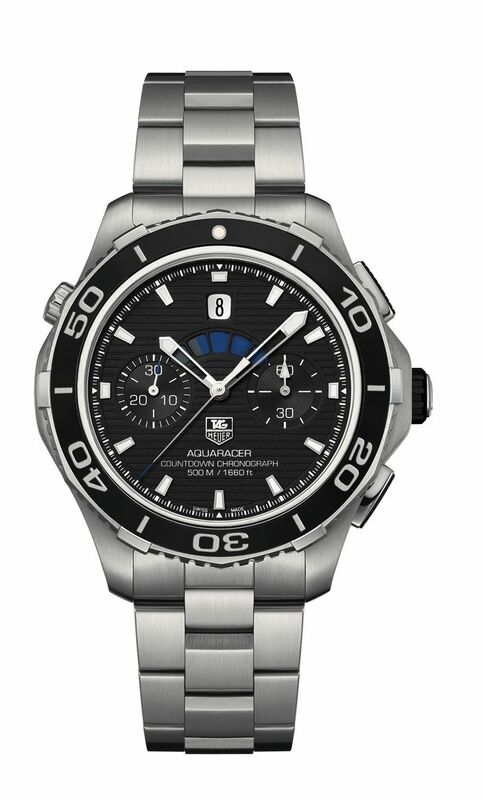 Tag Heuer Aquaracer Calibre 72 Countdown Chronograph. TNG Team Sailing Gents Limited Edition. 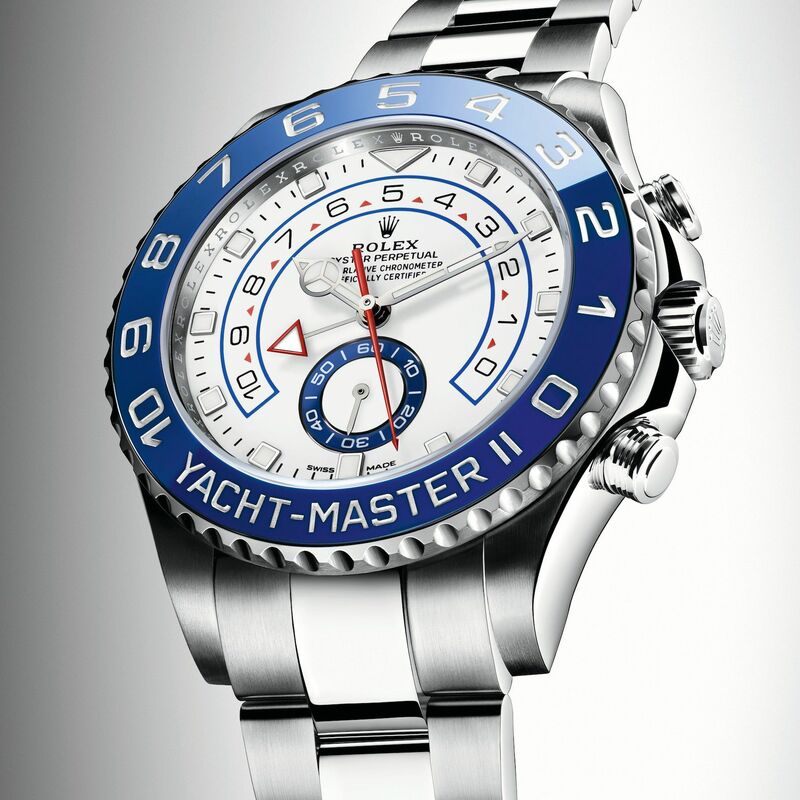 Nautically-themed watches have been a staple of the Rolex canon ever since the company was launched in the early 1900s. The famous waterproof Oyster case – as well as impeccable attention to detail in materials, movement and engineering – helped Rolex become the world’s premier luxury watch brand. But it was not until 2010 that Rolex launched its first regatta timer, the spectacular Yacht-Master II (44mm), which cleverly features a rotating outer bezel to set the countdown time (from one to 10 minutes) for a race. But wait; there’s more. If the wearer has missed the first starting signal, they can set the countdown timer “on the fly” to synchronise with the race start. For this watch, Rolex came up with an entirely new movement, the Calibre 4161, which includes all the usual above-and-beyond engineering features Rolex prides itself on (ultra-accurate chronometer rating, that Oyster waterproof case, screw-down winding crown and more). Rolex has other models in the Yacht-Master family, most spectacular being the Yacht-Master 40, its 18-karat gold case framed by a bezel set with 32 sapphires, eight tasvorite gemstones and a diamond at 12 o’clock. It is only fitting that Tag Heuer is a member of the exclusive regatta timer club; after all, its long-forgotten ancestor Berna was one of the originators of the idea. The Aquaracer Calibre 72 (43mm, water-resistant to 500 metres) has the countdown indicator at 12 o’clock on the dial, plus sub-dials for minutes and running seconds, and comes with a choice of either steel or black rubber bracelet. TNG stands for “tack ‘n’ gybe”, so this Dutch brand means business when it comes to specialist sailing timepieces. Founded in 1998, TNG offers a range of Swiss-made watches either with quartz or automatic movements (the automatic Valjoux 7750 movement has a special TNG regatta timer modification), all with a distinct nautical theme and developed with the input of top international sailors. Its flagship model is the limited edition, automatic movement Classic Tornado Sailing Chronograph, which features a five- or 10-minute countdown setting with a five-dot display. Water resistant to 100 metres, the 44mm Sailing Chronograph (AU$4,180) comes in three variants and sports a 42-hour power reserve. 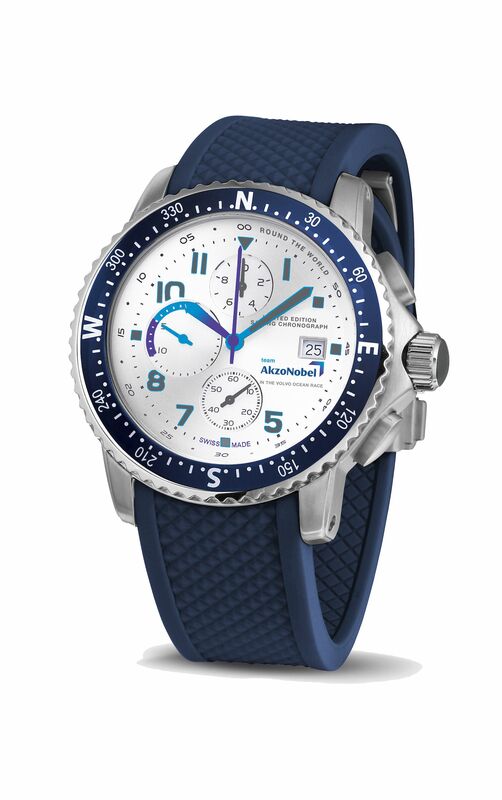 TNG has also released a range of quartz-powered models – both men’s and women’s – to mark its deal as official timekeeper with Team AkzoNobel for the 2017-18 Volvo Ocean Race. The Team Sailing Gents Limited Edition (AU$675) is a slick looking piece that is water-resistant to 100 metres, has the countdown timer on a sub-dial at nine o’clock, and features an engraved case back. Luxury Swiss brand Ulysse Nardin put in the hard yards to develop an ingenious (and patented) new regatta timer with the speccy Marine Regatta (44mm, water resistant to 100 metres, automatic UN-155 movement) and the effort paid off handsomely with the watch winning Best Sports Watch at Geneva’s 2017 Grand Prix D’Horlogerie. The company’s watch boffins have cleverly tweaked the countdown mechanism so that it not only marks off the minutes to a race but automatically begins timing the race (displayed in a sub-dial at six o’clock) once count down hits zero. 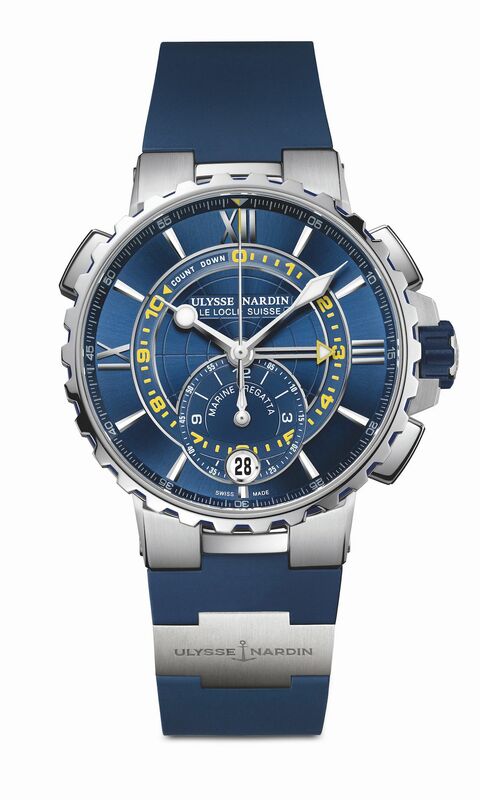 Ulysse Nardin developed the watch with input from sailors in Artemis Racing, its official America’s Cup team partner. 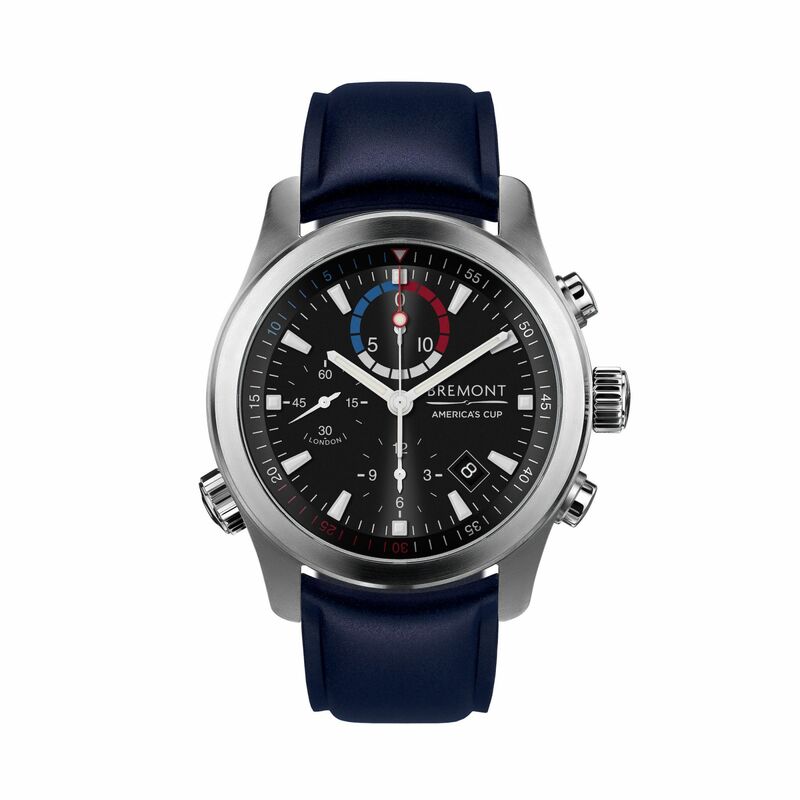 Available for AU$23,000 (blue and silver dials) or special Artemis Racing edition (just 35 pieces worldwide) for AU$43,600.